Digg Does The Acquisition Dance With News Corp.
San Francisco-based startup Digg has been in recent acquisition discussions with a number of companies, including News Corp., according to multiple sources close to the negotiations. However, the company was unable to land an offer in the price range they’re looking for – at least $150 million – and will likely close a Series B round of financing instead. It appears that rumors of the upcoming financing led News Corp. and possibly others to initiate acquisition discussions with Digg, and the discussions were subsequently opened up to other interested parties as well. No formal written offers for Digg were tabled, sources say, because Digg’s minimum sell price was at least $150 million. 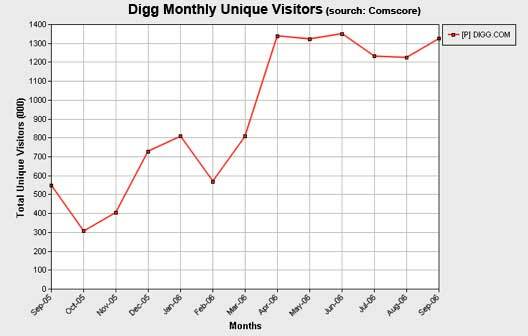 One point of controversy was around Digg’s claim of 20 million unique monthly visitors and steep monthly growth, whereas the Comscore’s most recent September report shows only 1.3 million monthly unique visitors and flat growth since April (see chart below). Comscore is notoriously flaky, and these numbers are for U.S. households only. Comscore is almost certainly significantly under-reporting Digg traffic. If a firm offer isn’t made in the next week or so north of $150 million, look for Digg to close a $5+ million second round of financing later this year, possibly with Greylock Partners. Greylock is already an investor in Digg, leading their $2.8 million Series A round in October 2005 (Omidyar Network and several angel investors also participated in the round).